I lived in Pattaya at the time when Action Street was opened, but I heard very little about it. I didn't even pass by it until some months after it had opened, and only then because some of the other online commentators at the time were talking about how quiet it was there. The only significant advertising that the place has ever had came indirectly via an old documentary about a British expat who had married a ladyboy an opened a bar i.e. the Sensations Bar - which happened to be located on Action Street Pattaya. For anyone interested in visiting the Sensations Bar, you won't find it there any more, it upped sticks and moved long ago to it's current location on Soi 21 just off Soi Buakhao at the more popular northern end. Action Street Pattaya, the venue that never happened. Action Street today remains a fairly desolate place with almost all of the beer bars there closed down, with just a few exceptions near to the entrance of the complex. Advertising on local Pattaya TV channels. Advertising on lots of online platforms. Advertising on the baht buses. Special shows like the Nanapong dance contests in Bangkok. Sporting events like a Thai boxing contest. Free shuttles to Action Street from Walking Street. It's not as though things were done on the cheap during development either. Action Street itself is just the standard beer-bar set up, but the Blue Rahtree which is located right next door is a multi-level indoor facility that is actually quite impressive. I can only hope that the mothballs in which it is currently wrapped are equally impressive! The multi-level indoor Blue Rahtree bar complex. The Blue Rahtree also seriously lacked custom right from the launch day, and that really is a big shame because the infrastructure there is excellent, and much better than most of the other more popular bar areas around town. The girls in Pattaya are well known to be a friendly lot, but the girls here were in serious need of customers, and it showed! If you like a lady who is eager then you could have been a happy man in this place. Sadly, it is no longer open. Overall I'd say that if Action Street & Blue Rahtree were packed full with customers, events, and bar girls, then this would be a venue that you could happily spend a whole night in, but it isn't even worth a quick visit at the current time. I will continue to keep an eye on it, and hope that it works out in future. 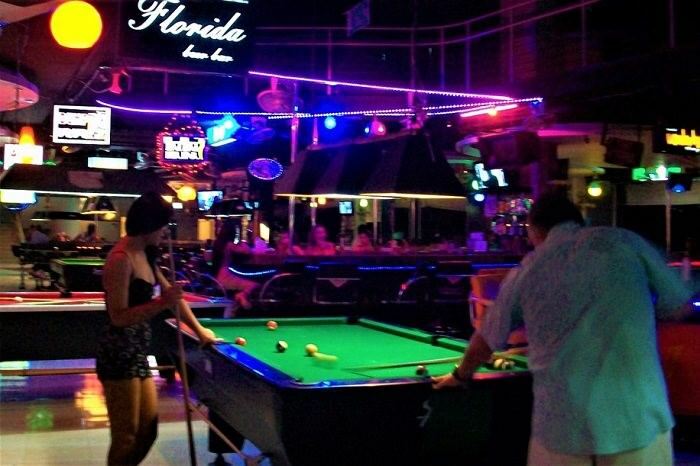 If it ever gets the attention & customers that it needs, we'll be looking at another Pattaya nightlife gem! 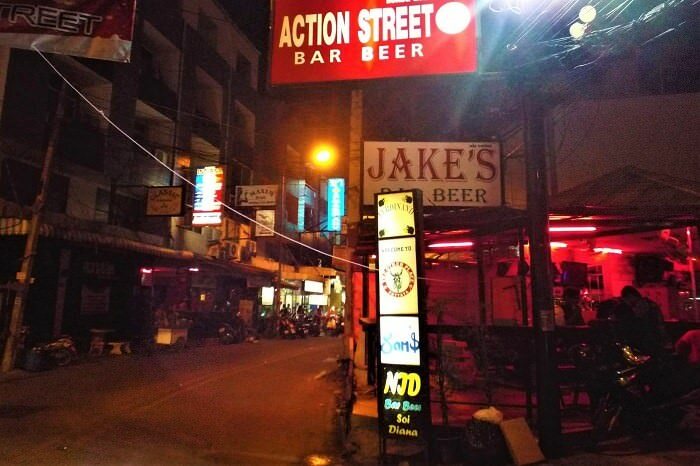 As mentioned, the bars on Action Street are pretty much standard Pattaya beer bars. They are arranged in a sort of circular fashion with a central island. More bars are located on that central island. I'm told that, at the far end of the complex there were plans for the construction of at least one gogo bar, but nothing ever came of that as far as I know. I had considered deleting this page from my site but I've decided to keep it going for a while because there are still some possibilities for a decent future here. For one thing the surrounding area is undergoing development and other parts of Soi Buakhao have really benefited from it, and I wonder if those benefits will spread further down the soi. 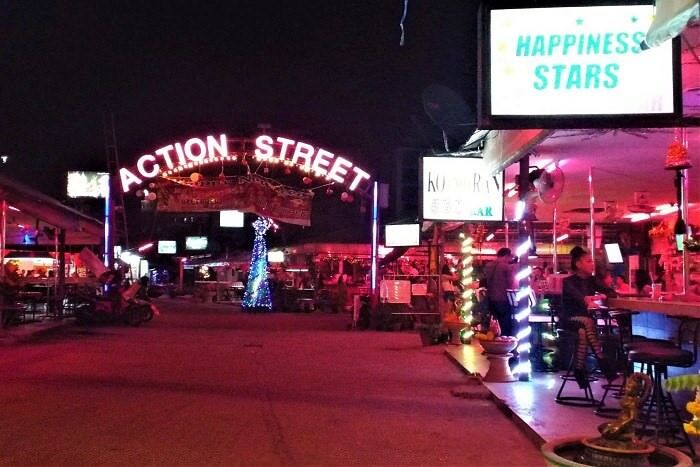 If you are familiar with the geography, Action Street Pattaya is located a little further down Soi Buakhao, about halfway between Soi 15 (where the popular Hideaway bar is located) and South Pattaya Road. If you are driving by it is easy to miss because the neon signage in the top picture is set back from the main road. All you'll see without turning your head is the unobtrusive red sign pictured above. The hotels in this area of the city are cheap, especially for monthly agreements, and there are lots of condominium units available for purchase/rent. If you are thinking of coming on a long-term visit then you could do a lot worse than pitching your tent in this area - at least you can expect quiet peaceful nights! I try to be fair in my reports and look for the good and bad points about any particular item under review, and Action Street Pattaya is no exception to that approach. There are a lot of positives about the place and I actually feel quite disappointed by the lack of promotion that has been done here, because all of the hard work in building the place is already done. I do have to caution anyone who ventures to this part of town though, not because of how quiet it is since I've already done that above, but because hidden dangers can sometimes lurk in the quiet places of Pattaya. I haven't heard anything specific, so this isn't an accusation, but it is a fact that the business model in these sorts of places is often to go for the quick money. The bar owners probably know that first-time visitors are unlikely to become return visitors due to the lack of action on Action Street, and that might tempt them to run some sort of scam. I reiterate that this is just speculation on my part, but I doubt that the bars here are making any money at all, and that can lead to some shady business practices. On a positive note, the surrounding area can be a good place to do some shopping during daylight hours. There is a good market in between Action Street and South Pattaya Road where you can pick up some cheap clothing, and if you want to shop for electronics, the nearby Tukcom I.T. 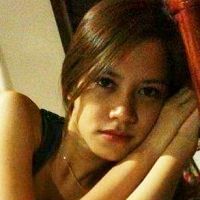 center on South Pattaya Road is the best place in the city to do it.